restylingmag.com March 2015 | Restyling & tRuck AccessoRies 27 A roundtable discussion on common shop challenges and solutions rounds out the education program. You may take as many classes as you like, all included with regis- tration. Plus, THE SHOP SHOW presents "Training in the Hall," a program in which exhibitors present 15-20-minute in-booth sessions. Evans Cooling Systems, Ham- merhead Armor, Lund International, and North Light Color/HEXIS are a few of the exhibitors offering in-booth classes. EnginEs & FEaturEd VEhiclEs Performance & Hotrod Business' Technical Contributor, Mike Mavrigian, will be on hand to explain the processes involved in recent engine builds that will be on display in the Performance & Hotrod Business / Restyling & Truck Accessories booth during the show. A number of cutting-edge vehicles will also be on display throughout the exhibit hall to illustrate how custom shops have made use of various products (as well as to show off the creative side of the custom automotive business). For example, Hammerhead Armor's "Project Armament" is a 2015 Ram 2500 Mega Cab featuring a number of premium products, including Hammerhead Armor Pre-Runner front bumper, Hammerhead Armor rear bumper and Hammerhead Armor running boards. CSC Customs of Baton Rouge, Louisiana did the complete build. Also look for a Jeep Wrangler and a Chevy Silverado on display in the Meyer USA booth, as well as an ATV that will be given away during the show. A gooseneck trailer will be on hand in the B&W Trailer Hitches booth to dem- onstrate how heavy duty hitches are a solu- tion for builders who use larger trailers to transport project vehicles. B&W will be dis- playing gooseneck, 5th wheel and receiver hitches, all of which present an alternative to shops that transport project vehicles. " We see a lot more people trailering rather than driving their expensive cars," says B&W's National Sales Manager James Works. " e trend is toward bigger trailers. ey want their cars enclosed, and a bumper hitch is not enough anymore; they need to go to these gooseneck trailers." Wide aisles give attendees plenty of space to mingle at THE SHOP SHOW. 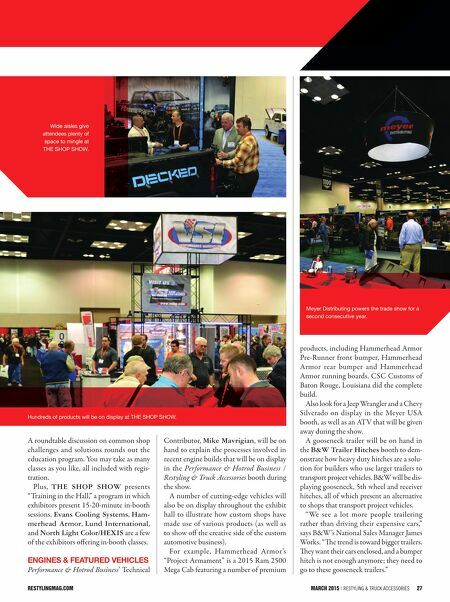 Meyer Distributing powers the trade show for a second consecutive year. 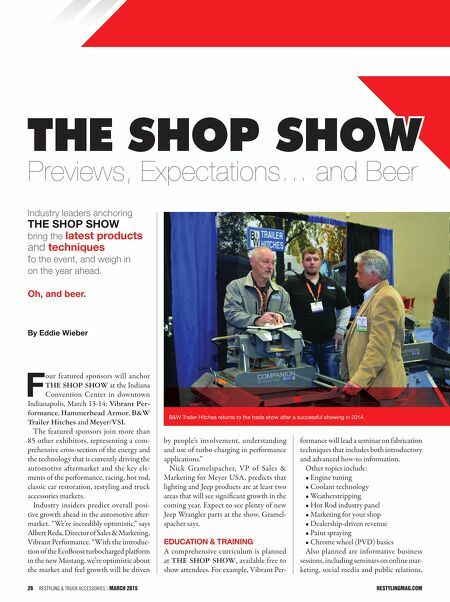 Hundreds of products will be on display at THE SHOP SHOW.